The status of Tri-Cities area properties with foreclosure activity during the first three months of this year is basically flat with levels from the past two years. At the same time, there has been a shift in the region’s two largest county markets. 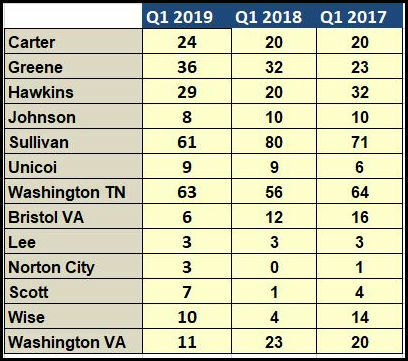 The number of foreclosures in Washington County TN increased from Q1 last year they decreased in Sullivan County. Although the number of new filings increased last year, the foreclosure rate for the region’s two metro areas is back to pre-recession level of about one-half of a percent. There were 270 properties with foreclosures in Q1 according to Attom Data Solution’s U.S. Foreclosure Market Report. That number is unchanged from the first three months of 2017. The differs from the national situation. Attom’s report says filings were down 15% from Q1 last year. The report provides a count of the total number of properties with at least one foreclosure filing entered the Attom Data Warehouse during the month and quarter. Some foreclosure filings entered into the database during the quarter may have been recorded in the previous quarter. Data is collected from more than 2,200 counties nationwide, and those counties account for more than 90% of the U.S. population. ATTOM’s report incorporates documents filed in all three phases of foreclosure: Default — Notice of Default(NOD) and Lis Pendens (LIS); Auction — Notice of Trustee Sale and Notice of Foreclosure Sale (NTS and NFS); and Real Estate Owned, or REO properties (that have been foreclosed on and repurchased by a bank). For the annual, midyear and quarterly reports, if more than one type of foreclosure document is received for a property during the timeframe, only the most recent filing is counted in the report. The annual, midyear, quarterly and monthly reports all check if the same type of document was filed against a property previously. If so, and if that previous filing occurred within the estimated foreclosure timeframe for the state where the property is located, the report does not count the property in the current year, quarter or month.